Q. How are you, Secretary Rumsfeld? A. Could I be doing better? Yes. Am I still sleeping at night despite the intense criticism I've been receiving in the past several months? Yes. Am I using any drugs to get to sleep during this difficult time? No. Alcohol is NOT a drug! Q. Thanks for speaking with us today. Some have said..
A. Have some said I should resign? Yes. Have others said that I should be fired? Yes. Will I resign? No. Will I be fired? Can't tell. As far as I know, George is the only one who can fire me and he is still returning my calls. A. Do I feel great about the way the War in Iraq is going? No. Could it be going better? Of course. And showers of gold could be flowing like water out of my ears. But it's not going to happen. Will we stay the course until Iraq is free? Of course. Will it cost us? Yes. Do I feel great about that? No. The death or injury if any of our young men is a great burden to me. Q. What about the death and injury of young women? Q. Women are in the military too. A. Are they? Didn't know that. Are the deaths and injuries of our young men and women a great burden to me? Yes. Q. Ummmmm.... You didn't even know there were women in the military? A. Do I know everything about our Armed Services? No. Nobody can know everything about our Armed Services. Do I have to know everything about the Armed Services in order to lead them? Not necessarily. General Macarthur didn't know squat about his Armed Forces and he is considered a great man and a great military leader today. As a matter of fact, I was just having a conversation with him about what we should do in Iraq. Did he say "Stay the course or the terrorists will have won"? Yes. Q. General Macarthur is dead, sir! A. Is Gen. Macarthur dead? Yes. Is this is shocking news? Yes. Was he a great man and a great leader? Yes. Q. 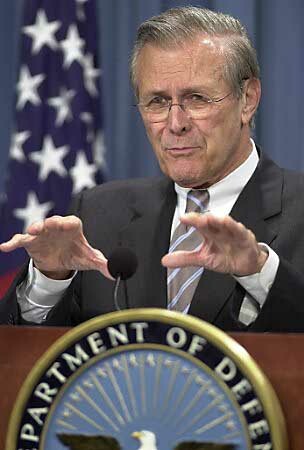 Thanks for your time, Secretary Rumsfeld. Get me outta here! A. Do I feel bad for the deaths and injuries of our brave young fighting men throughout the world?